Join them and share your success story too. Find out how LiveChat has helped thousands of companies across the globe to build better relationships with customers, increase conversion rates and sell more. From the sales side, customers who use LiveChat on our site are 4.85 times more likely to make a purchase and their per-session value is almost 400% higher than the site average. Cannot find the proper use case for LiveChat in your industry? Don’t worry. With more than 26,000 companies using LiveChat, we have prepared effective solutions for different industries. LiveChat allows your agents to handle 10 times more customers than a phone agent! This effectiveness turns your agents into Support Heroes. Are you ready to empower their skills even more? LiveChat helps customer support teams provide real-time, professional and personal service to their clients. Don’t take our words for granted, see what other businesses say about LiveChat. LiveChat focuses on delivering the best customer support tool for companies like yours. High ratings are insurance of the best quality software that meets your business expectations and create a unique experience for your customers. 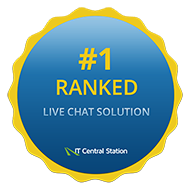 More than 26,000 companies have trusted LiveChat software to help their teams improve customer satisfaction. Meet them.